Planned vendor outreach could help district maintain accessibility for all at Harbor Island. SAN DIEGO — Protecting and encouraging an inventory of lower cost recreational and visitor facilities on the San Diego waterfront will be the focus of a planned Request for Proposals, the port district’s board determined at its December meeting. The Port of San Diego’s Board of Port Commissioners directed the district’s staff to draft a Request for Proposals (RFP), Dec. 5; the RFP would test the marketability of lower cost overnight visitor accommodations at a portion of Harbor Island designated for redevelopment. Accessible recreational and visitor amenities could include public fishing piers or floating docks, dock and dine piers, low-cost or free moorings/boat slips and water taxis, according to port district staff. “The [port] district acknowledges that the importance of lower cost visitor and recreational facilities and recognizes that such facilities, depending on their nature, are consistent with the Port Act and the Public Trust Doctrine,” port district staff stated in a report to commissioners. Lower cost recreational and visitor facilities are established through leasehold revenues, according to port staff. Such revenues have helped the port district establish or maintain five fishing piers, four public viewing piers/platforms, three boat launch ramps and free moorings/docking, according to port district staff. “The revenues also are used to provide public infrastructure, such as streets, sidewalks, public restrooms, and landscaping. Therefore, it is important for the [port] district to balance providing such facilities with revenue generating efforts,” port district staff stated. Details of the RFP, of course, will be revealed over time. Whatever the port district develops, however, would likely have to muster the support of the California Coastal Commission. The Coastal Commission and port district were far apart on the inclusion of lower cost amenities associated with Harbor Island’s planned redevelopment, as reported by The Log in May. 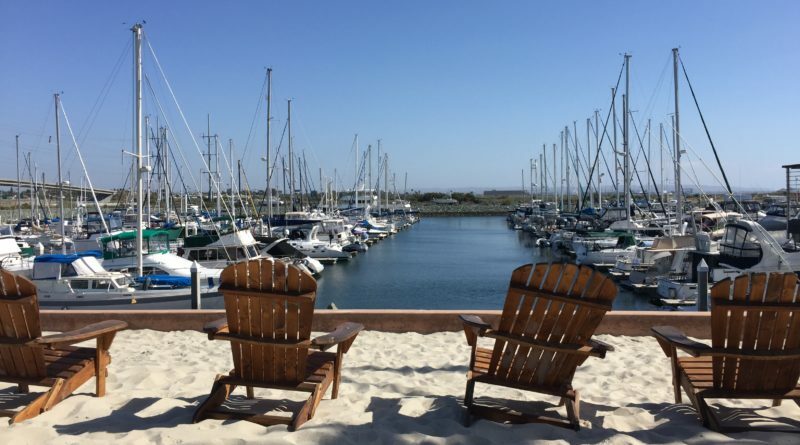 Coastal Commission members specifically stated plans to redevelop Harbor Island, an area known for its combination of marinas and hotel venues. At least one Coastal Commission member stated the port district was not doing enough to ensure certain visitor amenities on the waterfront were accessible to all. The Coastal Commission had rejected a port district’s request for master plan amendment by an 11-1 vote at that May 11 meeting, coincidentally held in San Diego. A report issued by port district staff in November listed specific no or low cost amenities already functioning along the San Diego waterfront. Shelter Island Shoreline Park, for example, features one public fishing pier. The Shelter Island area is also home to four public anchorages (La Playa Cove, Shelter Island Roadstead, A-2 Anchorage, Guest Dock Anchorage) and three dock-and-dine venues (Bali Hai, Kona Kai Marina, Sun Harbor Marina). The port district is also redeveloping Shelter Island’s boat launch ramp; an estimated 50,000 boats are launched from the Shelter Island ramp each year. Other boater amenities in the port district are found at Harbor Island (dock-and-dine at Sunroad Resort Marina), Spanish Landing Park (public fishing pier), downtown Embarcadero (Laurel Street anchorages, dock-and-dine locations, public docks/piers), Coronado (anchorages, pumpouts, public docks/piers) and National City (boat launch ramp, public fishing pier).